Because of the climate and poor soils, it has been much easier to grow oats in Derbyshire than wheat. Oats and oatmeal replaced wheat in much of the bakery before the age of transportation. Derbyshire oatcakes are not like the Scottish version, however, which are dry digestive sized biscuits. 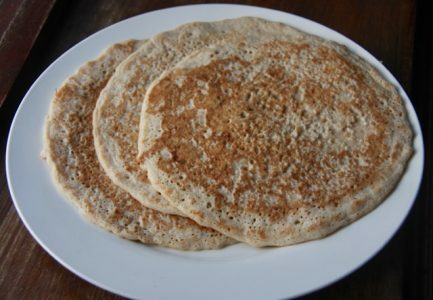 The Derbyshire oatcake is more like a cross between a pancake and a warm flour tortilla wrap. It’s generally made with 50% oatmeal with all its associated health benefits. You can make them (see a recipe below) or simply buy them cold from the local butcher or baker. How long do Derbyshire Oatcakes stay fresh? They stay fresh for about 10 days in a bag in the fridge. Can you freeze Derbyshire Oatcakes? Yes, put a sheet of clingfilm between each one so that you can take them out individually – they become a very handy resource to have in the freezer. How do you reheat Derbyshire Oatcakes? What can I put on a Derbyshire Oatcake? You can put pretty much anything savoury or sweet onto an oatcake, roll it, wrap it or leave it open. Traditionally oatcakes were served as part of an English breakfast. They are a great way to use up leftovers, especially if they contain some sauce such as curry. The simplest thing to do with them would be to grate some cheese and add fried onions and mushrooms. You could also try spinach or peppers, hummus or perhaps some tinned salmon. Wrap gently and tuck in!. How many calories are in a Derbyshire Oatcake?